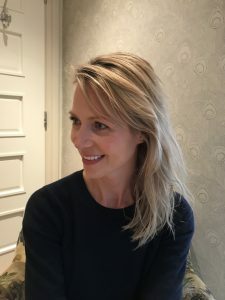 I recently received an invitation from Natalie James, The Business Makeup Artist, to join her for one of her Strategic Shopping sessions at Liberty. I obviously accepted immediately! Not only was I super excited about the prospect of spending the morning in Liberty, I was also very excited about having my hand metaphorically held, while perusing the world-famous beauty hall. I am a total novice when it comes to makeup and my makeup bag is quite frankly embarrassing. On a daily basis I use a pressed foundation, powder, mascara and lipstick. To spice things up I occasionally use a bit of eye shadow and liner, but that’s as good as it gets. To make things worse, I have stuck to the same products for years, with the exception of lipstick which I am fractionally braver with. My last makeup session with a professional makeup artist was 11 years ago, just before I got married! Natalie runs a consultancy service which specialises in helping women find the right makeup for them. She has a wide range of clients but is particularly passionate about helping women in business. 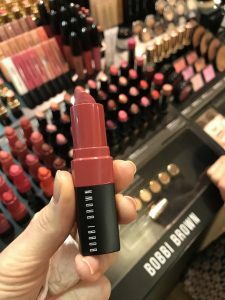 She helps them to discover the power of strategic business makeup; makeup which takes into account a woman’s role, the industry she works in and her lifestyle. Natalie believes that ‘no makeup makeup’ or subtle makeup is the new power dressing and can help to leave a fantastic first impression. 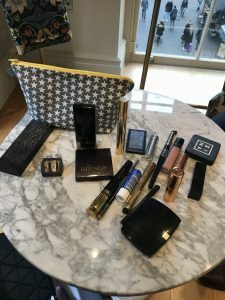 Before our meeting I was asked to complete a brief questionnaire which asked me what I would like to achieve from the session, any particular techniques I would like to learn and a few questions about my current makeup bag and routine. On the day of our session we met in the comfort of the Private Suite in Liberty. We had a chat after which Natalie began detoxing my makeup bag. I was SO embarrassed about its contents but Natalie, who really knows her stuff, was so lovely, totally down to earth and instantly made me feel at ease. 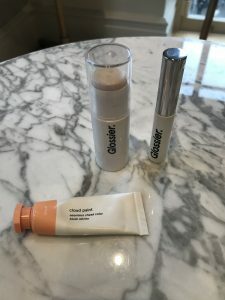 After the detox we went downstairs to the beauty hall to try out lots of products which were chosen specifically to suit my colouring and skin type. I was also taught various techniques such as contouring and the best place to apply blush. The beauty hall is incredibly impressive but to a novice like me is also totally daunting. Had I been left to my own devices I would have probably turned and run or would have made a bee line for the counters that I have used for the past 10 years buying the same old products. With Natalie’s help we quickly navigated the counters and tried a whole range of things, some of which I didn’t even know existed. In the space of two hours we did it all. I walked away knowing exactly what I needed. I was totally thrilled with the natural ‘no makeup’ makeup. 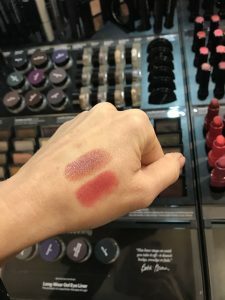 Natalie also recommended some great lipstick shades – shades I wouldn’t have otherwise tried – as well as products to help reduce fine lines (or not so fine in my case as they seem to be an increasing problem as I race towards the big 40!). 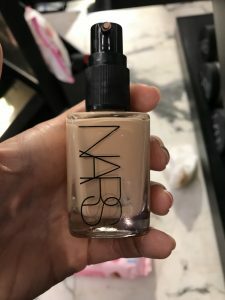 After our session in the beauty hall we went back up to the Private Suite and Natalie ran through what I should buy now, what I could add to the Christmas list and what I could add to the longer term wish list. The fantastic thing is that, because Natalie is completely brand agnostic and doesn’t work on commission, there was no pressure to buy anything at all. 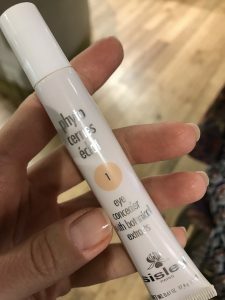 Despite having the session in Liberty Natalie gave me a comprehensive list of products that would work for me from a wide range of stores, surprisingly including Boots and The Body Shop. It was so refreshing to hear that Natalie felt that some of the cheaper brands were equally as good as some of the designer brands for certain products. A few days after the session Natalie sent me a bespoke follow up report which is included in the package price. 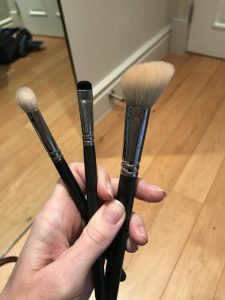 For me this was an invaluable part of the service as not only did it include a tailored makeup ‘wish list’ which I can keep returning to, it also included tips on how to apply and wear each product. If, like me, you haven’t given your makeup bag an overhaul in a long time, Natalie is your girl. I really was so impressed and so pleased with the results. The personal shopping experience is a great thing to do for yourself or it would make a fantastic gift for someone. From now until Christmas, Natalie is offering a 15% discount on any of her services using the code ‘BRICKS15’. 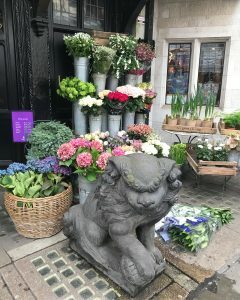 A two-hour personal shopping service with Natalie (which is what I had) is £200.00 (before the discount). You can also follow Natalie’s top makeup and beauty tips on Instagram (@businessmakeup) and on her Facebook page.